Ed Ruscha, Standard Station, 1966. Color screenprint, 25 5/8 x 40 inches. Published by Audrey Sabol, Villanova, PA. Collection of the Fine Arts Museums of San Francisco. Museum purchase, Mrs. Paul L. Wattis Fund, 2000.131.5.1 © Ed Ruscha. Courtesy of the Fine Arts Museums of San Francisco. July 16, the de Young Museum opens Ed Ruscha and the Great American West, a survey exhibition of the artist’s work with the image and character of the American West Coast. 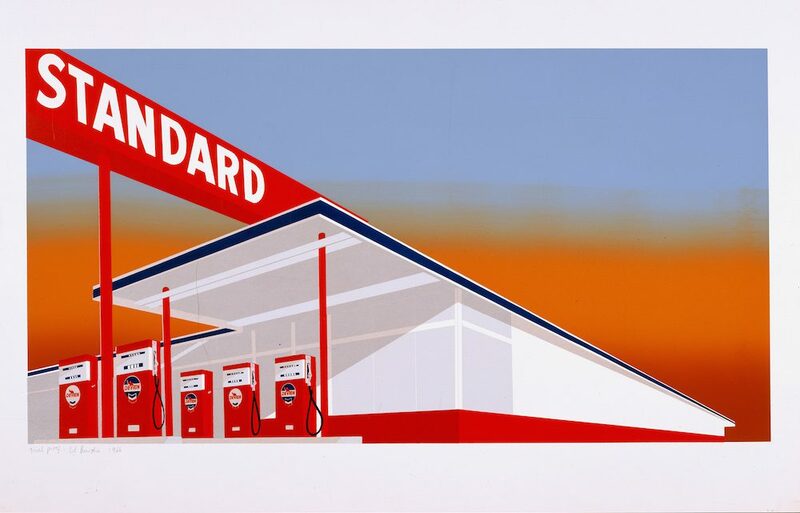 Ruscha has worked in California for more than 50 years, after having driven west from Oklahoma in 1956 at the age of 18. Divided into nine sections, the exhibition examines the artist’s particular fascinations with the Western landscape—auto repair shops, billboards, gasoline stations, the Hollywood sign. Ed Ruscha and the Great American West includes early work, as well as prints made as recently as 2015. The last issue of SFAQ (#24) included an interview with Ed Ruscha, now available online. 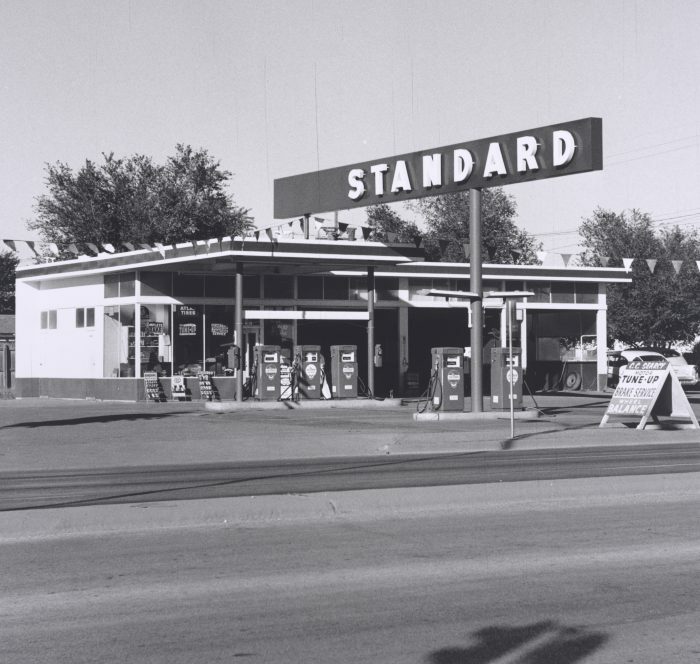 Ed Ruscha, Standard Station, Amarillo, Texas, 1962. Gelatin silver print, 4 15/16 x 5 1/16 inches. Collection of the Whitney Museum of American Art, New York. Museum purchase, with funds from The Leonard and Evelyn Lauder Foundation, and Diane and Thomas Tuft. Courtesy of the Fine Arts Museums of San Francisco. 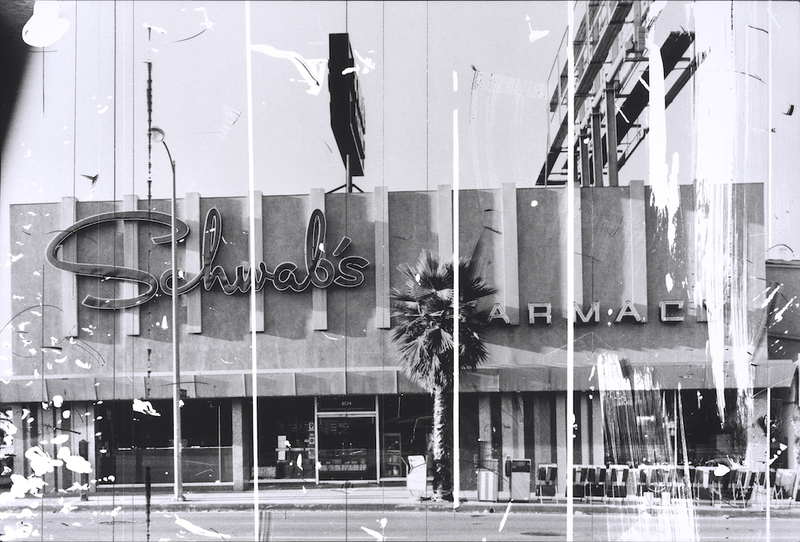 Ed Ruscha, Schwab’s Pharmacy, 1976, from The Sunset Strip, series published in 1995. Gelatin silver print from altered negative, 20 x 30 inches. Published by Patrick Painter Editions, Vancouver and Hong Kong. Collection of the Fine Arts Museums of San Francisco. Museum purchase, Mrs. Paul L. Wattis Fund, 2000.131.193 © Ed Ruscha. Courtesy of the Fine Arts Museums of San Francisco. 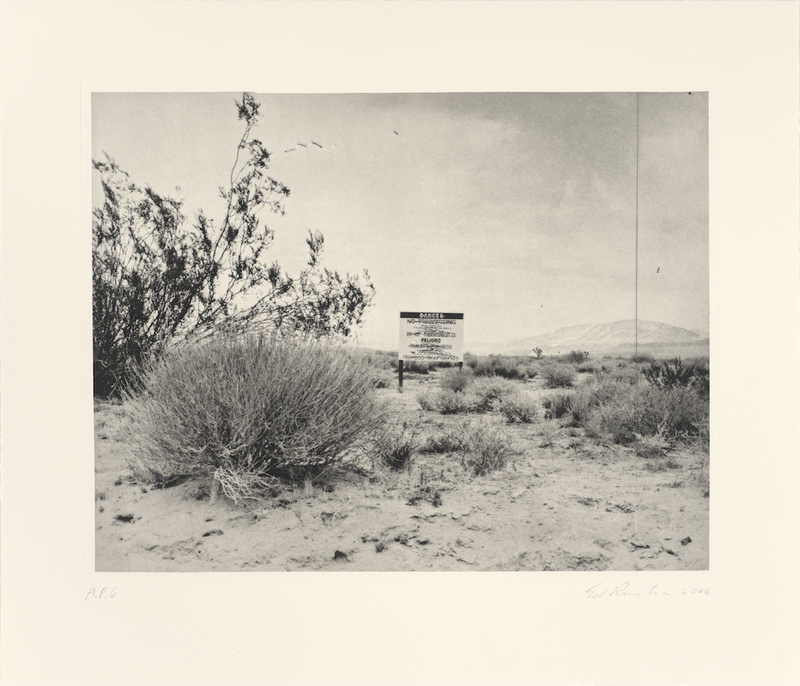 Ed Ruscha, Desert Gravure, 2006. Photogravure, 21 1/4 x 24 3/4 in. Published by Crown Point Press, San Francisco. Collection of the Fine Arts Museums of San Francisco. Crown Point Press Archive, gift of Crown Point Press, 2006.94.2 © Ed Ruscha. Courtesy of the Fine Arts Museums of San Francisco. 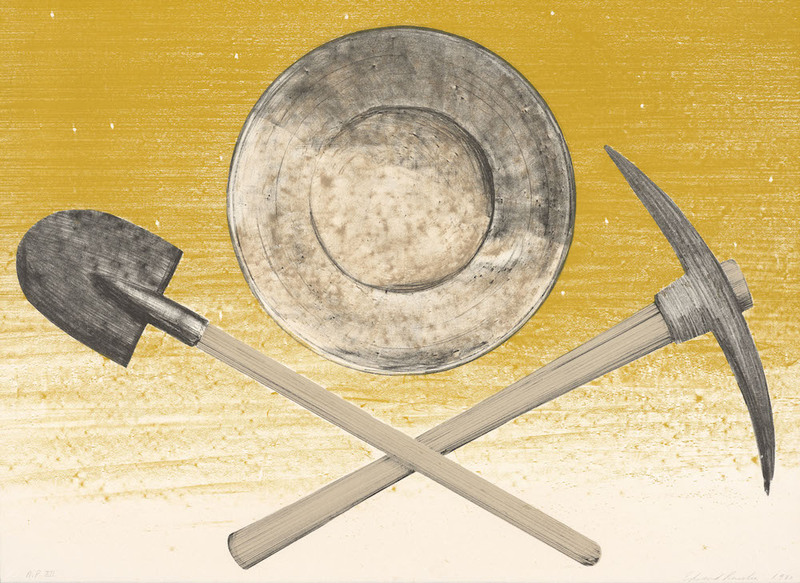 Ed Ruscha, Pick, Pan, Shovel, 1980. Color lithograph, 22 3/16 x 30 1/16 inches. Published by Graphic Arts Council, Los Angeles County Museum of Art. Collection of the Fine Arts Museums of San Francisco. Museum purchase, Mrs. Paul L. Wattis Fund., 2000.131.95.1 © Ed Ruscha. Courtesy of the Fine Arts Museums of San Francisco. 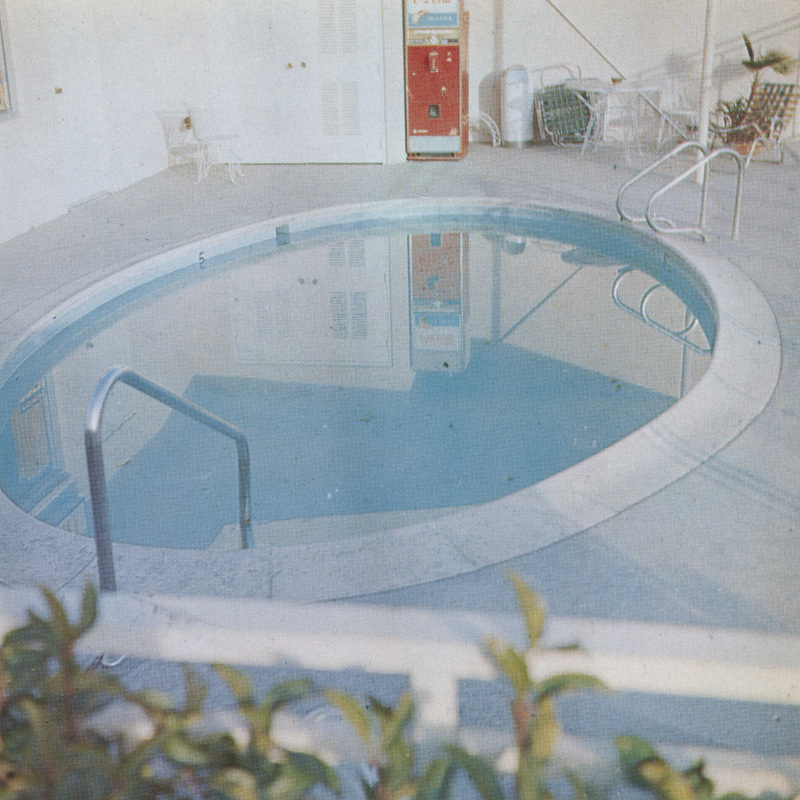 Ed Ruscha, Pool #7, 1968, from Pools, series published in 1997. Chromogenic print, 20 x 20 inches. Published by Patrick Painter Editions, Vancouver and Hong Kong. Collection of the Fine Arts Museums of San Francisco. Museum purchase, Mrs. Paul L. Wattis Fund, 2000.131.215 © Ed Ruscha. Courtesy of the Fine Arts Museums of San Francisco. 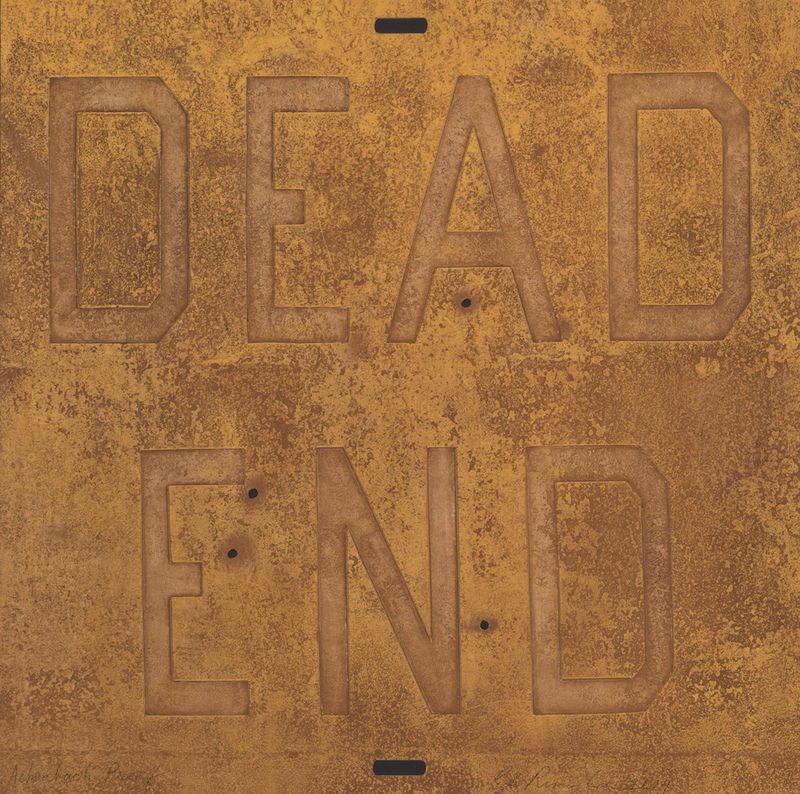 Ed Ruscha, Dead End 2, from the series Rusty Signs, 2014. Mixografia print on handmade paper, 24 x 24 inches. Published by Mixografia Workshop, Los Angeles. Collection of the Fine Arts Museums of San Francisco. Gift of the artist, 2015.73.32 © Ed Ruscha. Courtesy of the Fine Arts Museums of San Francisco.